With any injury the key to successfully administer first aid is a quick response time. This holds especially true for first aid eye treatment since this bodily area is especially sensitive. An injury to an eye is more common than one would think and can occur both at home and at work. Other kind of injuries caused by power washers are not uncommon either. The first and most important aspect of any type of first aid is to be prepared for whatever may arise. When undertaking any type of hazardous activity it is extremely important to wear the proper eye protection. 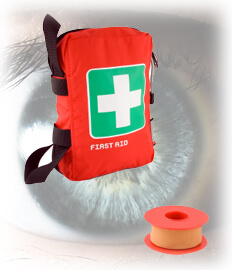 It’s important to remember that prevention is often the best form of first aid eye treatment. There are basically four types of eye injuries each with their own specific treatment method as described below. Immediately after contact with a chemical the area should be washed thoroughly with an emergency eye wash. This first step is the most important in first aid eye care will since a fast response time will improve the chances of eliminating any vision loss. It is important to remember not to use an eye cup and seek immediate medical attention after flushing the eye. As your mother always told you whenever you got something in your eye rubbing it will only make it worse. Use an emergency eye wash to flush the eyelid and hold the upper lid down over the lower lid after flushing. Holding your upper eyelid works the object towards you’re the corner of your eye. If the speck is particularly stubborn and will not come out after repeated uses of the emergency eye wash, then lightly bandage the eye and see a doctor. Immediately after impact you must apply a cold compress while applying gentle pressure to keep the swelling down. If the pain in the eye persists or the victim complains of reduced vision then seek medical attention. Symptoms such as these are often the first signs of internal damage to the eye. Unlike the other injuries mentioned here in this article, do not wash the eye out with an emergency eye wash for a cut, scratch and/or puncture. If the injury involved a puncture to the eye and the object is still lodged there then do not remove it and seek immediate medical attention. For injuries that involved cuts or sever scratches, use the lower lip of paper cup placed along the bottom of the eye to act as a shield. The eye is one of the body’s most sensitive and vulnerable parts which are why the use of safety equipment is so important. By wearing the proper power washer safety equipment, you can greatly reduce your chances of sustaining any type of eye injury. But we all know accidents happen, no matter how prepared one might think they are. When an unfortunate incident arises, being prepared for a quick response time could be the difference between a minor and major eye injury.